With the current U.S. presidential election season being so crazy interesting, how in the world do we convince young people to get involved in politics? Feel Good Friday knows how... the Junior State of America! 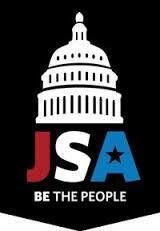 What is JSA all about? As stated on their website, "the mission of the Junior State of America and the Junior Statesmen Foundation (JSA) is to strengthen American democracy by educating and preparing high school students for life-long involvement and responsible leadership in a democratic society." They do that with civics education and leadership programs for high school students. What began in 1934 at the Montezuma Mountain School for Boys in the Santa Cruz Mountains, has become a national organization with chapters all across the country and 500,000 alumni! During the school year, students organize all aspects of this school-sponsored extracurricular club. That includes planning and executing political-awareness events, conventions and conferences at the local, state and national levels. When the school year ends, there are a variety of pre-college summer programs for high school students. Activities include student debates, excursions to historic places, and presentations from influential leaders. You can read this breakdown of programs to see the costs and the offerings. For those of you with high school students (or who are high school students) in the Bay Area, there are classes at Stanford! I feel good knowing there are young people who are interested in developing their leadership skills and making a difference in their communities. If you want to feel good about this on days of the week other than Friday, like the JSA Facebook page and follow them on Twitter @jsajuniorstate #bethepeople.